It is funny how some words enter the English language. I think you know that Kung Fu is often thought of as a member of the martial arts. Upon closer study, the real meaning means “time spent” and that in turn is why the martial arts it often represents is called that: it takes a lot of time to learn this technique. So, it is perhaps not a surprise that a firm who wants to market a device that reflects a lot of time and effort might use the phrase Kung Fu to reflect that. Innocent enough. Beware though what happens when you connect this to other thoughts. Susan and I are remodeling a house and were concerned about putting electrical outlets in our brand new cabinets that would deface the beautiful wood finish. So, quite naturally, I went online to see if I could find a modern outlet design that would be less conspicuous. Here is the link to the Amazon advertisement we noticed offered one. This design looked very clever and I ordered one. It came today and as I opened the box I became a bit alarmed at what I saw. See the picture to the right. My first reaction was that I had clearly ordered something other than what I thought. No … it was the pop up electric socket device and it was exactly the one pictured on www.amazon.com. Now when I reread the advertisement, I can hear the foreign voice at work here. Translation is not the same as transcreation. Some things might work perfectly well in Chinese or Japanese, but lose or even gain something in translation. You might like to know that Esso Oil company changed its name decades ago when they went international because Esso in Japanese meant broken down car. 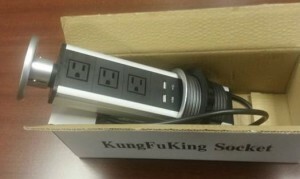 KungFuKing Socket seems to follow the same communication path. So, be careful as you consider multiple languages on your web presentation or customer communication. Next Next post: New Year’s Resolutions … oh no, not again!